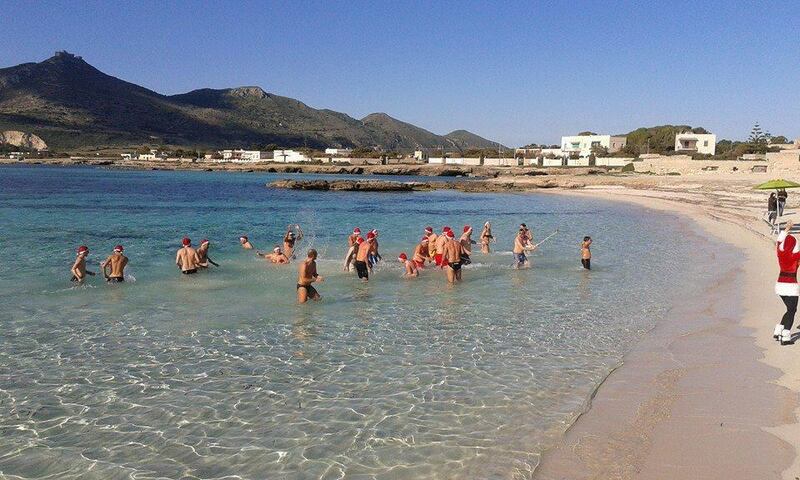 The appointment is lunchtime for a group dive and a happy Ring a Ring-o’Roses in the crystal-clear waters of Favignana, one of the Egadi islands. 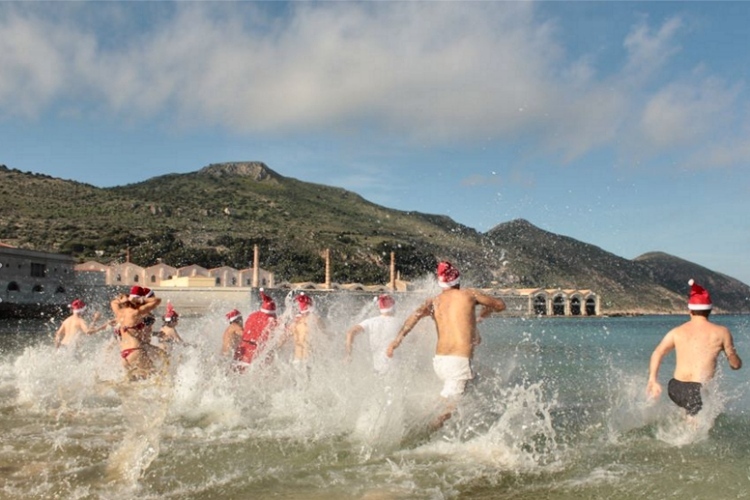 A group of adventurous and enthusiastic people celebrate Christmas by taking a dip in the sea just off Lido Burrone beach, wearing swimsuits and a Santa Claus cap. 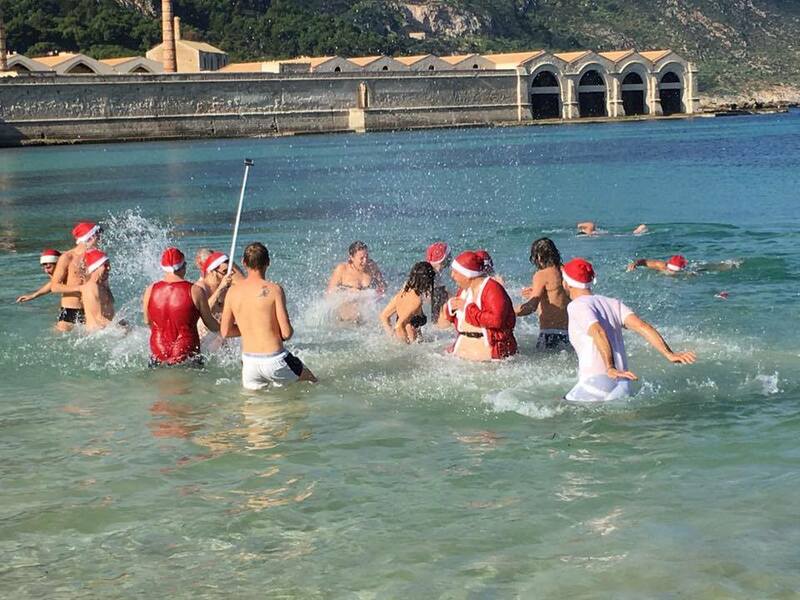 After a plunge they celebrate with a group photo, panettone for all and a prosecco toast to Christmas in this beautiful seaside setting. This is becoming an annual event on Favignana. 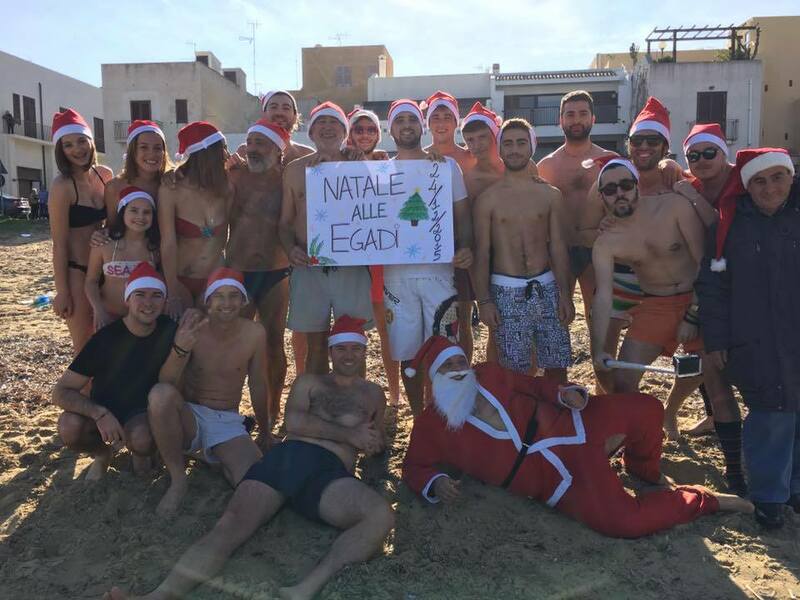 Thanks to the mild climate and warmth of the Sicilian sun, many surfers have taken the opportunity to celebrate Christmas eve surfing the crystalline waves of the Sicilian sea for many years now. After the lighting is set up on Marettimo and Levanzo, it’s Favignana’s turn as the children prepare a tree decorated with small fish made from recycled plastic as a tribute to the island’s fishermen. After which it’s time to prepare and inaugurate the Santa Claus Village. The village has been hugely successful over the past years. 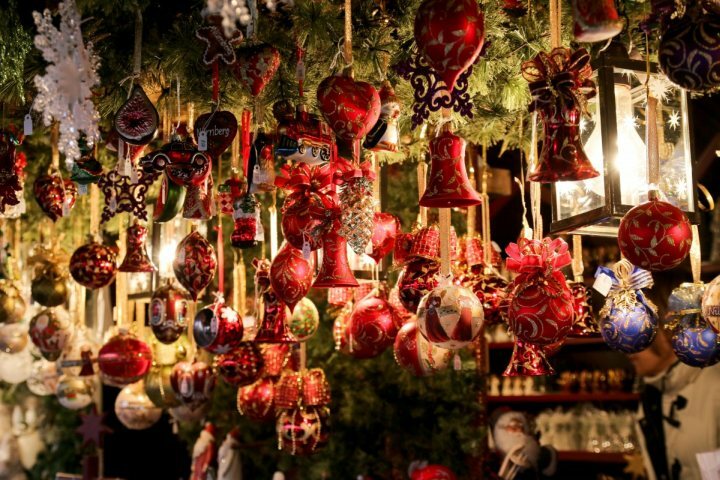 For the duration of the Christmas and New Year period it has attracted a popular following of both children and adults entertaining them with amusements and re enactments of sacred traditions. 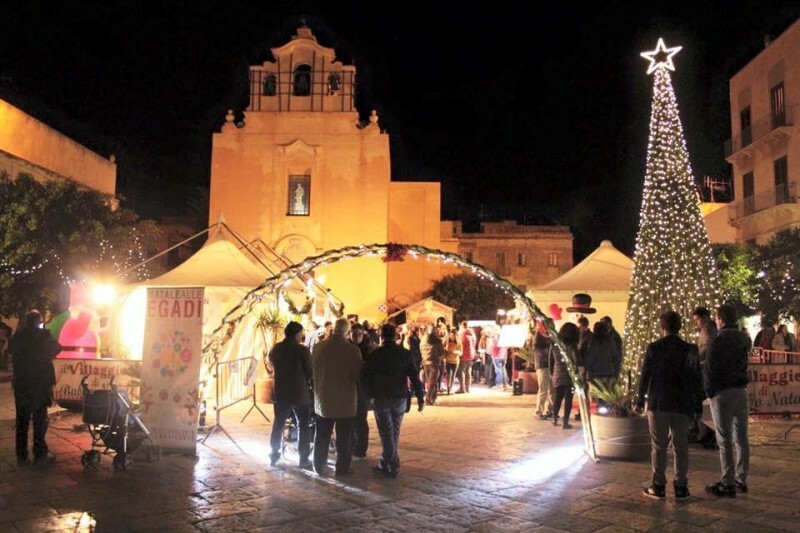 For thirteen days The Village of Santa Claus hosts a special playground for children, fairytale attractions, and tastings of local products and goodies and a team of animators perform their songs, dances and educational workshops. The idea was made possible thanks to the synergy of three local associations: GIM, Excursions and the Bellini Band. 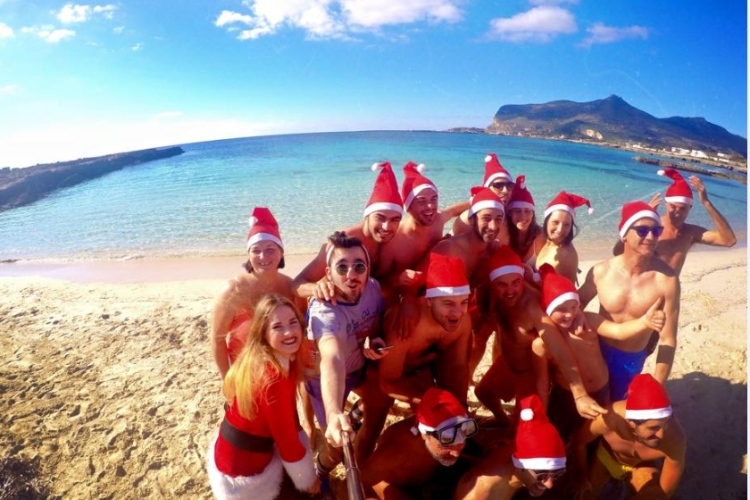 Patronage of the municipal administration and other associations on the island in addition to local volunteers and the parish create a celebratory Christmas for residents, visitors and tourists alike who choose the Egadi Islands for a festive atmosphere of great charm.